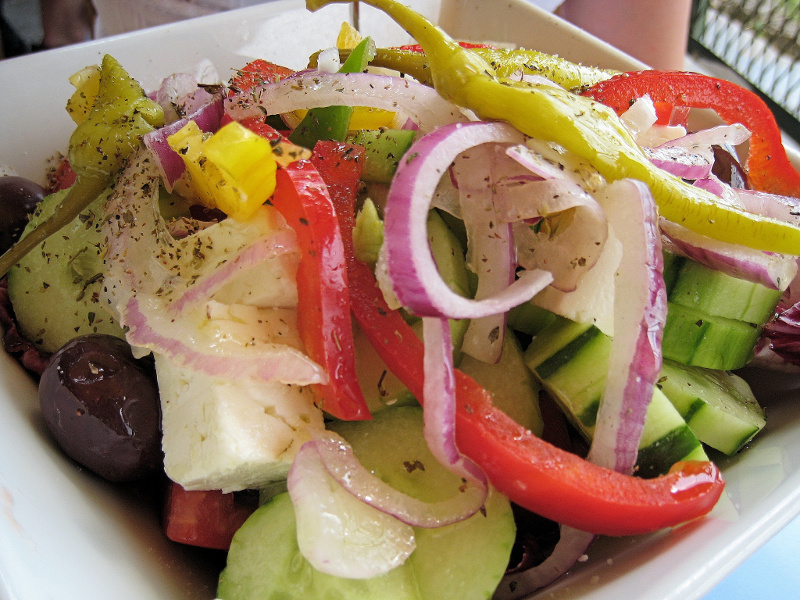 Horiatiki salata is your basic big, fat Greek salad. "Horiatiki" means village-style. This fresh, healthy salad is found in one form or another throughout the eastern Mediterranean. The same salad with the addition of sumac and toasted pita is known as fattoush in the Arab countries. Turks serve ezme salatası a more finely chopped version. Toss the vegetables, olives and cheese together in a large, non-reactive bowl. In another bowl, whisk together the olive oil, vinegar, garlic, oregano, salt and pepper. Pour the dressing into the bowl with the vegetables and toss together. Set aside to marinate for 30 minutes and serve cold or at room temperature. Ezme Salatası (Turkish tomato-cucumber salad): Eliminate the olives and feta and add 1 red pepper and a big pinch of paprika and a small pinch of cayenne pepper. Chop all the vegetables very finely with a knife or pulse them in a food processor. Mix all the ingredients together and chill. Drain off any excess liquid and serve as an accompaniment to grilled or roasted meats. Lemon juice can be substituted for the red wine vinegar. Fattoush (Arab vegetable and bread salad): Omit the feta and add one bunch of chopped parsley and some chopped mint and cilantro. Use lemon juice instead of red wine vinegar. Tear or cut up two pitas into pieces, toast the pieces in the oven and toss the pieces with the salad. Add a tablespoon of sumac powder if you can find it. Israeli Salad: Omit the olives and feta. Lemon juice can be substituted for the red wine vinegar. Toss a chopped head of Romaine lettuce in with the vegetables after they have marinated for 30 minutes for a more substantial salad. Add a chopped green or red bell pepper if you like. Don't use canned, pitted olives. If you can't find Kalamatas, any good quality black olive will do.